SOME PEOPLE LIKE TO JUST SIT AROUND THE BEACH FOR THEIR VACATION. SOME GO FISHING, SOME GO ON A CRUISE. BUT, THEN THERE ARE THOSE WHO LIKE TO GO TO THE EDGE. 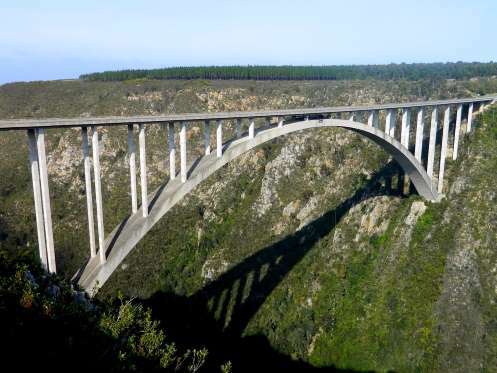 The tallest commercial bungee jumping attraction in the world is at the Bloukrans Bridge in South Africa. It’s 708 feet above the Bloukrans River. That’s a long way down to think about whether the cord will snap at the bottom. 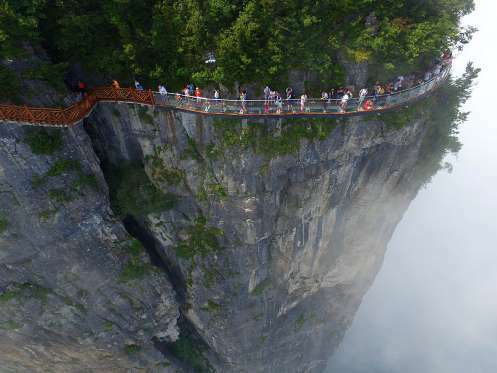 In the northwest of China’s Hunan province, travel visitors can talk a leisurely stroll along the walkway attached to Tianmen Mountain – 4,700 feet above the ground. The glass-bottomed walkway is more than 300 feet long and only about five feet wide, providing an experience that’s sure to leave you clutching the rockface for support. Noteworthy for its distinction as Europe’s highest suspension bridge, the attraction sits more than 9,000 feet above sea level. There might not be any glass bottoms, but that’s not exactly comforting when the entirety of the Swiss Alps rests beneath you. 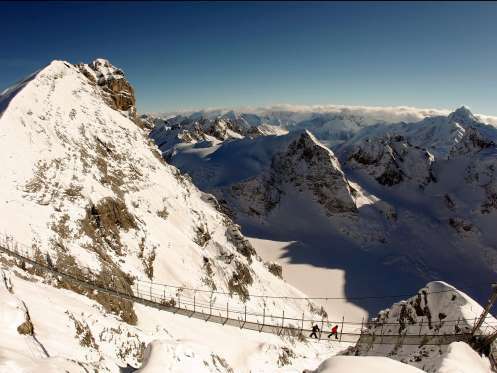 If you’re not in the mood for a walk through the Swiss Alps, why not take a couple steps into the French Alps? 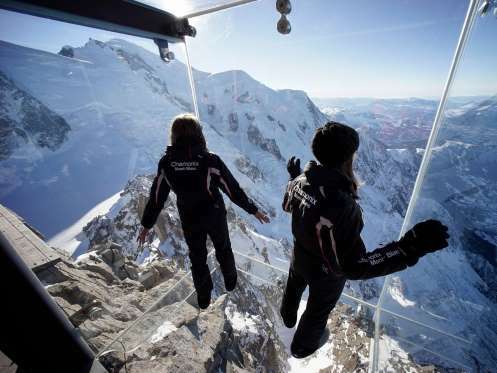 Step Into the Void lets people venture onto a reinforced glass platform to immerse themselves in the surrounding mountain range. Looking down is pretty much unavoidable, but if you’ve traveled all that way, why bother? What a great place to travel ! If postcards don’t do the Grand Canyon justice in your opinion, consider walking out to the edge of the Skywalk and snapping a photo at the railing. 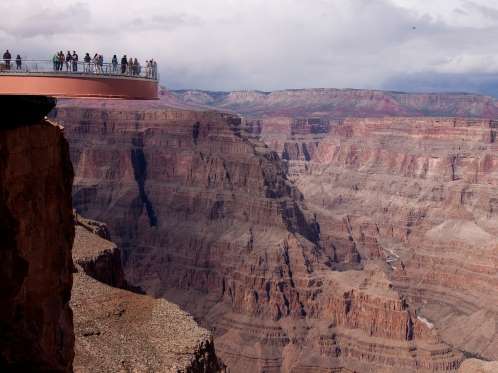 Located roughly 720 feet above the canyon floor, the ledge juts out directly over the vast, empty space. 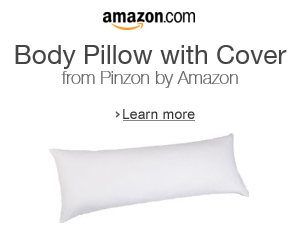 Oh, and it’s glass-bottomed. The tallest attraction in Toronto lets people stand right on the edge of the CN Tower and lean over. To the uninformed spectator, it may look like visitors have a death wish, but each participant is safely harnessed in. When you’re nearly 1,200 feet above the ground, you’d better be. 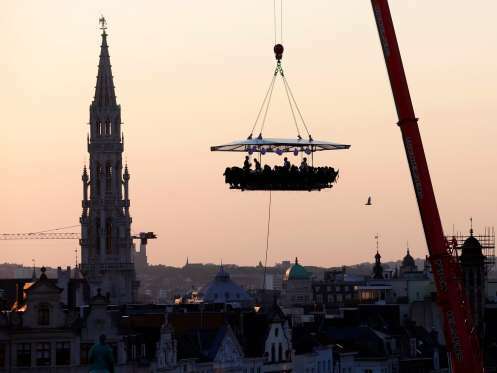 Dinner in the Sky is exactly what it sounds like. In cities all around the world, you can pay to strap in around a dining room table as a chef prepares a gourmet meal directly in the center for you and 21 other guests. All this while dangling from a crane 180 feet in the air. 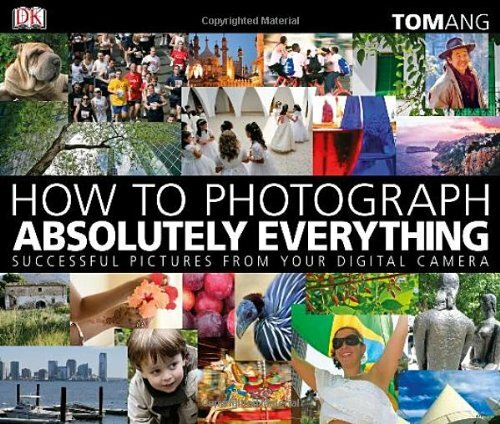 An interesting travel idea. You’ll have to venture to Dubai to enjoy the tallest observation deck in the world, located inside the Burj Khalifa skyscraper 1,820 feet above the Earth. If you still have any appetite after looking out the window, you can also enjoy the world’s highest restaurant, At.mosphere, just a few steps away from the deck. 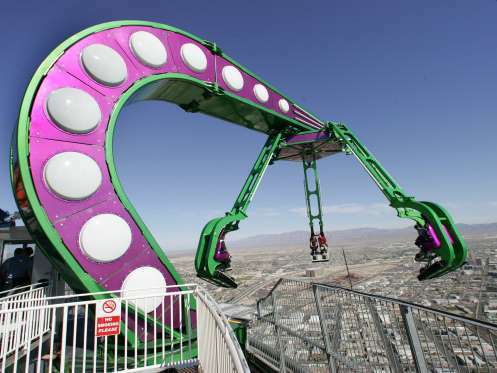 In true Las Vegas spirit, the Stratosphere Hotel boasts an eccentric set of rides right on the roof of the building. One is the X-Scream, an eight-person car that tilts out over the city and dangles the car perilously over the edge. The other is Insanity, a massive claw-like ride that extends 64 feet over the edge of the 900-foot tower and spins you in the air. If a trip to the CN Tower seems like a snooze, there’s always the wooden planks and rockfaces of Mt. Huashan. 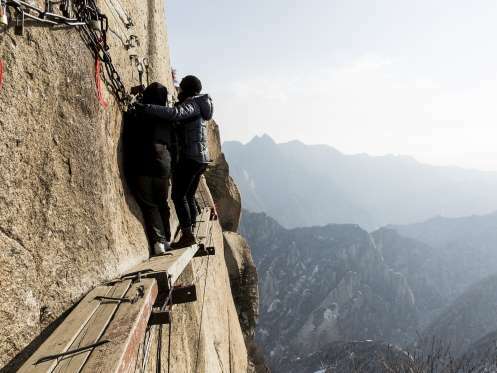 Visitors can hike along the side of the mountain by attaching harnesses to a chain strung throughout the path, which, by the way, ends at a tea house more than 7,000 feet above the ground. What an incredible travel destination. 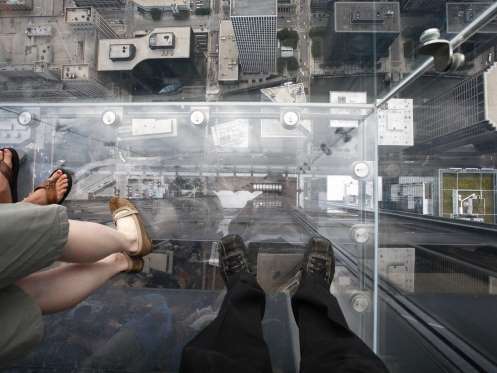 Chicago’s famed Willis Tower has attracted tourists from all the over world primarily for its glass-bottom observation window. Even when you know the glass is several inches thick and can handle several people at once, it’s still a long way down. 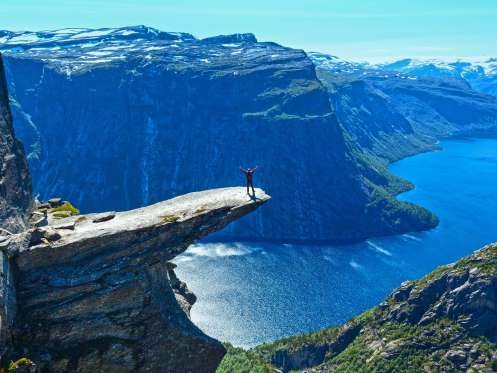 There are no railings to protect visitors at the Norwegian Trolltunga Cliff. If you want to take in the unadulterated beauty of the nearby cliffs and lake, you’ll need to mosey your way out to the ledge. But be warned, people have accidentally fallen off, and no amount of Instagram likes is worth such daring. 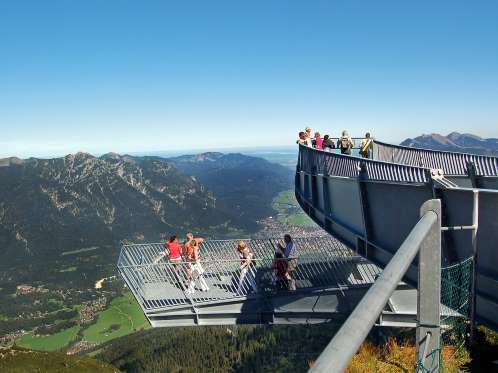 Like the Grand Canyon in Arizona, the Alpspix platform in Garmisch-Partenkirchen lets people walk out over the expanse they’re taking in. More than 3,000 feet above the valley below, the dual platforms allow melted snow and ice fall through slatted grates and keep the attraction open all year. 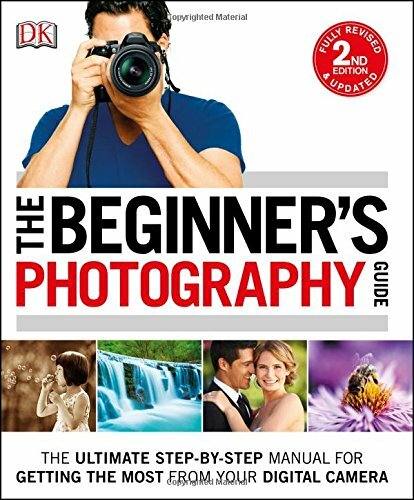 Now on sale at Amazon for only: $32.99. 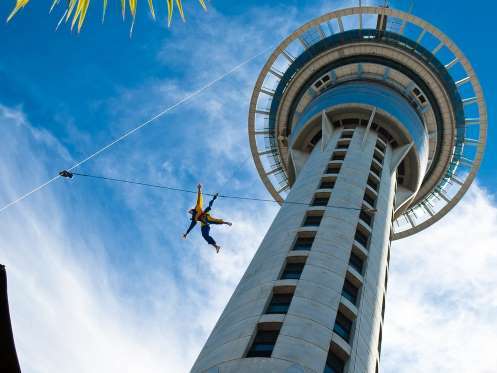 If you want to combine multiple thrills into one, consider the Sky Tower in New Zealand, where you can soak in the sweeping views of Auckland at 1,076 feet one moment and plunge to the Earth below the next. Of course, you are attached to the tower via a bungee cord and will not splatter once you complete your fall. That’d ruin your travel vacation for sure.